Cash for Clunkers – Saaaaaweeeeeet! 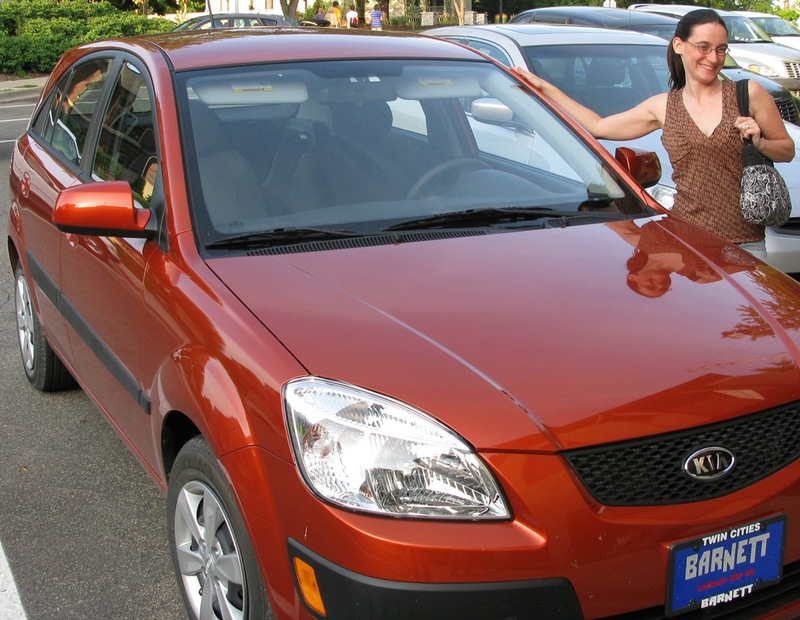 Nicole Maloney of Sweet Pea’s Loft, has a new Cash for Clunkers (CARS) car – a Kia Rio. She managed to get her old POS into the dealer before it died. I tried to qualify but my 1992 Camry doesn’t cut the mustard. The government sent me this Someecard, tho. Nice touch, Barry! Last Saturday I was having my car worked on at Dokmo (yes, I DO own and use a car!) and noticed there were no cars in the showroom and hardly any left on the lot. The woman at the service desk said it was because they’d all been sold due to the cash for clunkers program. Bill, Bob Collins has a post on his MPR NewsCut blog titled: Dealers running out of cars to sell. Also, MPR aired this today: Some question the environmental impact of clunkers program. Some of those car purchases would have happened anyway. The used-car market might go haywire. The program could depress sales of other goods. Drivers could end up burning more gas. I of course have mixed feelings about subsidizing auto use, which we already do through provision of free road use and parking and taxpayer-subsidized roads and bridges. But at the same time the auto dealers and companies seem to have been helped greatly by the program. They were in a world of hurt before it. Something else that hasn’t had much media coverage: the tax credits for energy-efficient windows and doors. We will take advantage of this (30% credit up to $1500). (It’s more of a delayed benefit.) That must have really helped the window and door manufacturers, so many of which are in the Upper Midwest: Andersen, Marvin, Pella, etc. I think Lisa Benson’s cartoon in the Pioneer Press 08/06 is very discriptive. Hopefully the link will go though Griff’s filter. The auto dealers are generally thrilled with Cash for Clunkers, though… esp. this week after the paperwork/processing kinks got fixed. ‘Twould be nice to see letters of appreciation for the Obama administration from Clancy Dokmo and Tom Furlong in the Northfield News. Mike- A great link, indeed. It reminds me of a lament I read last week in an editorial from a lower income person. What this person saw was the destruction of a car much better than they were driving. They also knew they would never be in a position to buy a new car, so they recognized the destruction of cars better than they were driving would limit their choice of available cars in their price range in the future. I think this is contemporary evidence of the “Broken Window Fallacy.” Just because the cat has kittens in the oven, it doesn’t make them biscuits. Mike Z, the government is now the biggest shareholder in the auto industry – cash for clunkers is just a way to unload dead inventory (already built aging cars) in an “off-balance sheet” method funded by taxpayers. This is exactly the type of transaction that Enron used – the speed with which the government has entered into deception is staggering – this $3 billion dollar loss should be on GM’s books but no doubt they will claim a profit and Obama will declare this a great government turn around story.